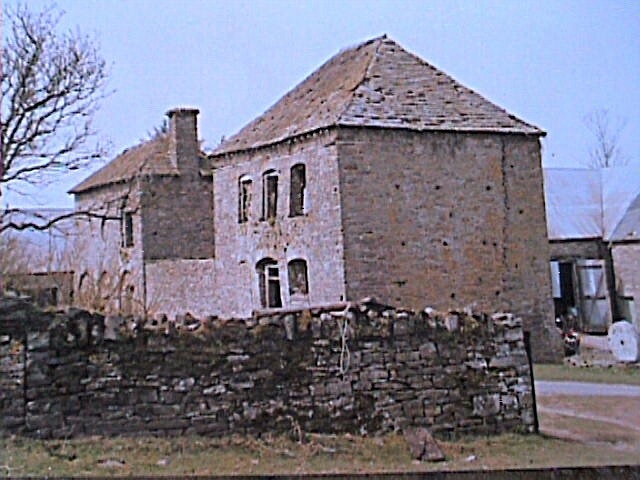 In 1993 Nigel and Joyce Gervis, founders and directors of Tŷ-Mawr Lime, purchased Tŷ-Mawr, a run-down farm in the heart of the Brecon Beacons National Park. As well as becoming the couple’s family home (and a life-time’s restoration project! 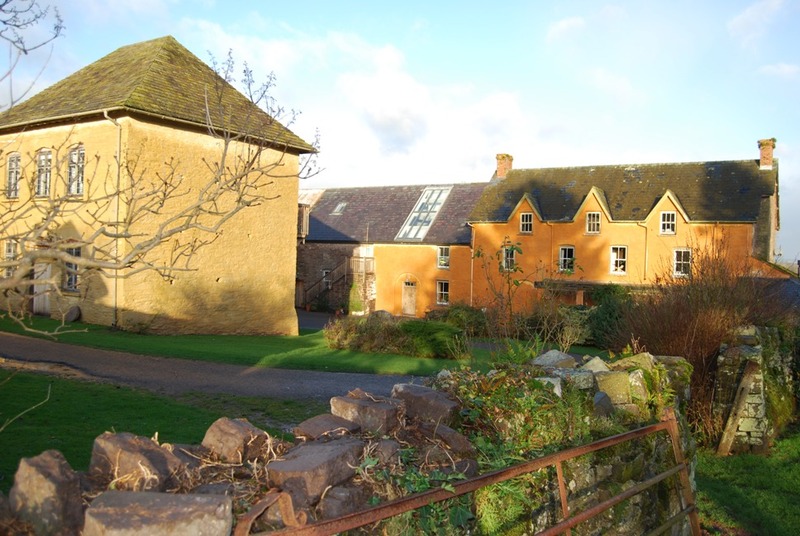 ), this listed property also proved to be the inspiration for their business Tŷ-Mawr Lime Ltd. The reason for this is simple. On purchasing the property, it was Nigel and Joyce’s intention to restore the building sympathetically and in-line with its architectural heritage. But the couple faced one key problem – they couldn’t source appropriate lime mortars and plasters! The initial solution was straightforward, using Nigel's experience, they began making their own. The potential for expansion was obvious and what started off as a temporary solution for a one off renovation project soon germinated into a business plan. Utilising Nigel's background where he had gained valuable experience of using lime in the early-late eighties with Capps and Capps on projects in London and then Wales and then as a self-employed craftsman, and Joyce’s experience in IT, project management and rural development, the couple established their own business. In 1995, Tŷ-Mawr Lime Ltd was born. Originally, the primary focus was the manufacture of lime-based building materials for the conservation of old and historic buildings. Lime mortars, plasters and paints have subsequently been supplied to some of the most prestigious conservation, restoration and, more laterally new construction projects in Wales and the borders. Buildings, organisations and projects that have benefited from Tŷ -Mawr products and expertise include Aberglasney House, the National Botanical Gardens, The Landmark Trust, Dolbelydr, St Teilo's Church, National Museum of Wales and Worcester Cathedral. Tŷ-Mawr Lime Ltd is still the only manufacturer of lime based products in Wales and this remains the company’s core area of business. What soon became apparent to Joyce and Nigel was that, just as UK lime production had diminished to almost nothing in the past fifty years, so had the skills and knowledge base required to use such products. 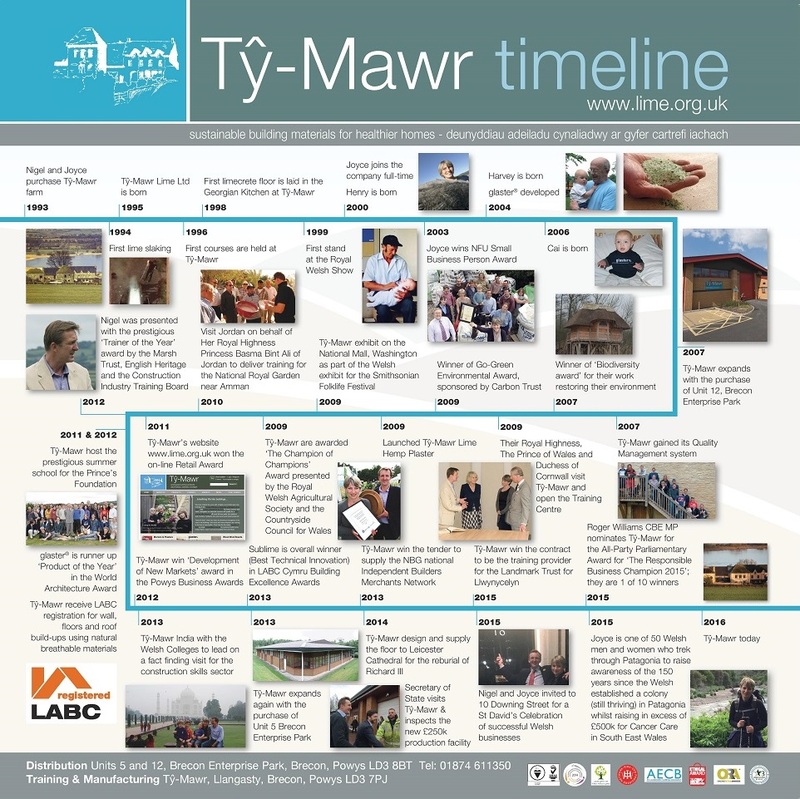 With calls coming in on almost a daily basis, asking for advice on product usage and application techniques, Tŷ-Mawr Lime Ltd established an education arm and in 1996 began offering courses in the use of traditional building materials. These courses have proved to be extremely popular and now attract delegates from all over the world. Tailor-made courses have been designed and run for a wide range of organisations including Local Authorities, British Waterways, the Canals Trust, the National Trust, Wales and Townscape Heritage Initiatives. 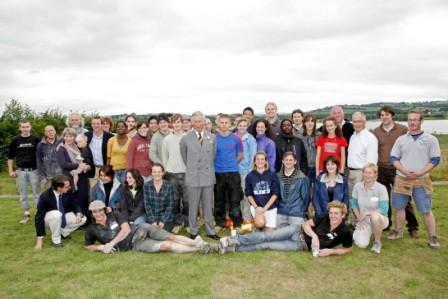 This year, they hosted and organised the prestigious Summer School for the Prince’s Foundation for the Built Envrionment with participants from all over the world. As well as concentrating on getting the practical skills right, Tŷ-Mawr Ltd has also focused heavily on the specification of traditional building products, so much so that the company is now certified to deliver RIBA accredited CPD seminars on using lime as a sustainable material appropriate to today’s world. Such seminars have benefited private architect practices, Building Control and other professional groups country-wide. They have also drafted a wide range of NBS clauses. Concern for the environment, particularly with regards to minimising the impact of buildings on the environment, quickly became an important focus for Nigel and Joyce. It remains one of Tŷ -Mawr Lime Ltd’s core business principles today. This philosophy is at the heart of the company’s development of a unique range of environmentally-friendly building materials compatible with ‘breathing building’ principles. The range includes paints and finishes, building boards including woodfibre boards, wood wool boards, reed mats and reed boards), as well as insulation products made from Welsh sheep's wool, hemp and cellulose (recycled newspaper). This dedication to the environment has earned Tŷ-Mawr several awards, particularly for their work in developing ‘greener’ alternatives to mainstream building products. Examples of this are glaster® - a lime plaster made with recycled glass instead of sand; Lime hemp Plaster, which uses hemp fibres instead of sand, and Limecrete, an environmentally-friendly alternative to concrete. In 2009, Nigel and Joyce were thrilled to be named as one of 52 sustainable development champions on the first Welsh Green List - a list recognising the commitment and contribution of individuals in Wales to the environment! Tŷ-Mawr itself is an on-going restoration project, and provides an excellent example of how Joyce and Nigel practice what they preach. As well as being the couple’s home and business base, the building is also now used extensively as a venue for visits from all sorts of groups concerned with building and the environment. As well as demonstrating examples of Tŷ-Mawr products, the building itself also incorporates environmental technologies such as solar thermal, rain-water harvesting and biomass heating. This has helped reduce Tŷ-Mawr’s carbon dioxide emissions by up to 40 tonnes per year, demonstrating that Joyce and Nigel are just as passionate about minimising their own impact on the environment as they are about developing greener building solutions. The lime industry has changed enormously over the last 20 years. At Tŷ-Mawr, we have watched, contributed and adapted to the changes that now sees lime as an ‘appropriate’ building material not only for traditional buildings but also new ecological buildings. The business has invested heavily in product development, research, testing, product accreditation, quality standards, custom built computer-controlled, highly energy efficient manufacturing machinery, expanding to a purpose built distribution warehouse as well as in building up a team of some 25 members of skilled staff to ensure the excellent quality of products and services that Tŷ-Mawr has become renowned for continues as the business grows. We hope that you find the website useful and that it helps you gain a greater understanding and confidence in specifying or using our products (both old and new.) We are adding to it daily - so please keep visiting or contact us if you cannot find what you are looking for! Building and buildings are one of the greatest polluters on the planet, one of the quotes we have used a lot as a business is that “you must be the change you want to see in the world”, we are slowly realising some of the change we would wish to see at Tŷ-Mawr and through our work and product manufacture, feel proud that we have now supplied over 12,500 other projects over the last 20 years, hopefully helping others be the change they wish to see as well!